I had read this book when it was first published in 2013. The second print was released in January 2014. It is a book to share, a book that will change your perspectives which is why I have chosen to review it for my first post in LitWorldInterviews. Though trained in therapy, this review is written not from the perspective of a therapist but rather that of a reader who happens to be a therapist. 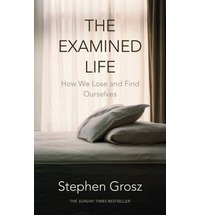 The Examined Life is a collection of essays based on Stephen Grosz’ case histories of his work as a psychoanalyst. In Grosz’ words, it is a book about ‘change and loss’. Grosz’ art in story-telling is apparent. The human-ness of each client, and the interaction between he and his clients cannot help but make the reader realise all of us share common experiences such as pain and suffering in our living, and we are creative and versatile of ways to protect ourselves by whichever means possible. In telling these stories, Grosz manages to enlighten the reader to the hidden meanings of his clients’ lives. There are the ‘facts’ obvious to all, and then his narratives which distil the motivations leading to a depth of understanding of the human psyche. The reader is also acutely aware the therapy process occurs within the confines of a therapist’s room, and the accounts told by the clients are rarely verified or corroborated. As a therapist, I am aware therapeutic ‘conversations’ are about honouring the client’s perspectives, not seeking ‘universal truths’. So the reader is left with stories of people as seen through the eyes of a highly experienced psychoanalyst and poignant narratives which prompt the reader to reflect on humanity. Take for example, the young man diagnosed as HIV positive who had spent some 3 years of his therapy sessions with Grosz mostly sleeping because it is there that he felt safe and thus could rest. That was a place of healing. Now reconsider the judgment we have of the benefits or the necessity or the efficacy of those sessions. This book is inspirational, thought provoking and highly entertaining. Most importantly, by the absence of technical jargon, it is accessible to all and not just those interested in or within the field of psychology. The essays illuminate and clarify the process of psychoanalysis – the conversations in therapy and the skills of listening, talking and being present with clients – without advocating for this specific technique or method. I recommend this most certainly to readers curious about the complexities of human mind and behaviour. A review I did on LitWorldInterviews.com a while back of a book worth recommending … still.